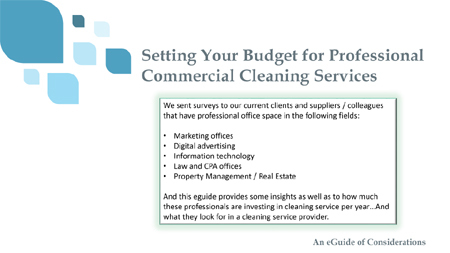 Setting your budget for commercial cleaning can be a challenge. You will have to source prospective service providers, develop an RFP, and contract services independently. While that seems like a huge task – there is value that can have a positive impact on your bottom line and profits. If this describes you situation, this eGuide offers tips and strategies to help with the process.